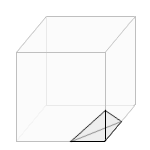 Calculations at a corner, which has been straight cut off of a cube or cuboid. This solid is also known as trirectangular tetrahedron. 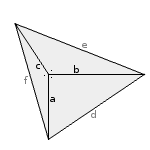 At the vertex abc are three right angles. Enter the three lengths a, b and c and choose the number of decimal places. Then click Calculate. The height h is the distance between the vertex at abc and the base at def. Lengths and height have the same unit (e.g. meter), the area has this unit squared (e.g. square meter), the volume has this unit to the power of three (e.g. cubic meter). A/V has this unit -1.